Jia is stylish in any language, as evidence by her debut on Telemundo. 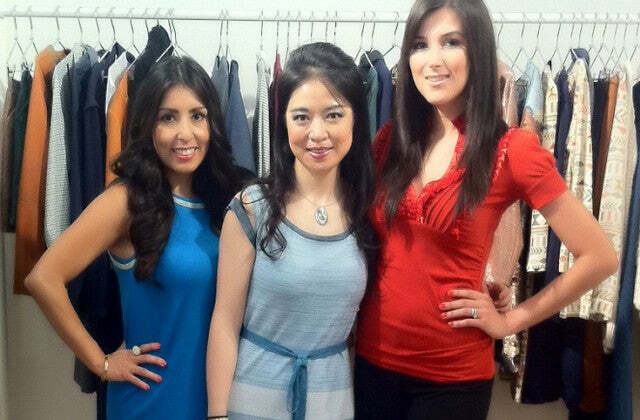 Jia Collection was chosen by Flor de Maria and Nadia Torres to feature on their fashion segment on Telemundo. Flor de Maria Rivera is a TV host, style, fashion & beauty expert, journalist, stylist, entrepreneur, brand ambassador, spokesperson and fashion & beauty blogger. In 2010, Rivera launched a very successful fashion blog, www.flordemariafashion.com, the first bilingual personal style blog in the United States. We absolutely love Flor’s sassy colorful style, oh and all her fancy shoes! You have to check out her blog! Nadia Torres is the fashion feature reporter of Telemundo. In case you missed our interview, here it is! We also translated it for our fans that aren’t fluent in Spanish, but don’t want to miss a word of Jia’s big moment! Nadia Torres: Two outfits in one! The reversible fashion of Jia Li has a repertoire of elegance, good taste, and a lot of style. Flor de Maria Fashion: You have two looks for one. You save money and, best of all, you save time. What else could you want? And best of all, you look very fashionable. Nadia Torres: The designer, Jia Li, elevates this concept and manipulates the different textures, colors, and forms to create outfits that are both multifaceted and functional. Jia: Modern women need convertible outfits, and my collection gives them various options so they easily look chic from morning to evening. Nadia Torres: A concept that we can all get behind! Flor de Maria Fashion: Here we have a gold dress. So beautiful, I love it! It’s ideal for going to work and if you don’t want to show off your shoulders, you just add this darling little jacket. Flor de Maria Fashion: And now we see the other side of the dress. Blue stripes in between and blue with some white stripes. It’s a little more casual so that after work you can go out and have a little wine with your friends. Nadia Torres: What a tremendous duo, right? And not only does it give us some nice variety, it saves us from falling into monotony and enables us to look as picture perfect as always with the same look. Flor de Maria Fashion: If you’re going on a trip, you can’t really pack all that much so you can just grab one piece and wear it different ways. Nadia Torres: All you have to do is reverse it and you’re ready! Stella Vellon (model): the one in blue dress with a light blue stripe on the waist with dark blue trim: It’s comfortable not only for women but for the budget. And it’s dynamic, versatile and fun! And it helps you look completely different in a blink of an eye. Flor de Maria Fashion: You yourself in your own home can do two looks for one. For example, if you have an old sweater in your closet, you send it out to a tailor, get the sleeves cut off, and you have a new vest. You can also wear a dress like a skirt, just put a top on and a belt and there you go! 2 WAYS. Reversible 2-look-in-one sheath dress. nautical stripe vs. gold jacquard. 2 WAYS. Reversible 2-look-in-one straight dress. Contrast lace panels vs. Contrast stripe. 2 WAYS. Reversible 2-look-in-one stripe pullover. bright stripe vs. muted stripe.